Diezel Herbert MK3 180-watt 3-channel All-tube Guitar Amplifier Head with Midcut Circuit, 3 Effects Loops, MIDI, and KT77 Power Tubes.Brand new for 2018, this new and improved Herbert is an absolute beast! The Most Powerful Diezel Is Now Even Better! Like its predecessor, the Diezel Herbert III is tailor-made for down-tuned guitars and modern metal, by nature of its infinite headroom. But the third iteration of this fire-breathing monster ups the ante with an overall tighter, more articulate voice, as well as a MIDI-programmable ± switch on channel two. The result is a better-sounding amp with more flexibility than ever before. Whether you play it clean or with Diezel's famous levels of gain, this 3-channel, 180-watt powerhouse delivers a tone that punches you right in the chest. High-gain aficionados will find much to love about the Diezel Herbert III. 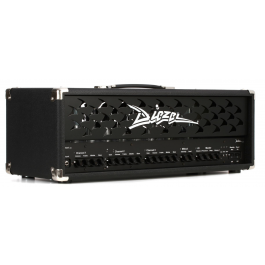 It wasn't long after Diezel released their first tube guitar amplifier head that the heads started popping up behind some of the most influential guitarists in the world — not bad when your first design remains your flagship! Guitarists such as Tool's Adam Jones, Journey's Neal Schon, and Metallica's James Hetfield were all early adopters to this new breed of tight precision distortion. Today, Diezel has greatly expanded their line of top-tier amplification. Sweetwater couldn't be more proud to represent the quality and tone that is Diezel Amplification. Each of the Herbert III's three channels offers its own voice and gain level. Channel one is a favorite in studios around the world for its spanky cleans that remain pristine at high levels. Channel 2 is a rocker's dream, delivering everything from crunch to metal. And Channel three brings in a bit of a low-mid focus, fattening up your single-note solos. In the master section, you're able to fine-tune the Herbert III's performance with its Midcut circuit, presence and deep controls, and two switchable master volumes. And best of all, you get all this tone-shaping power in an amp that is easy to use. When you turn the Herbert III around to take a look at its back panel, you quickly realize how truly flexible this amp is. Parallel, series, and footswitchable effects loops are all available to mate perfectly with your rig. A dedicated tuner output and mute switch make your performance and transitions spot on. And the amp even offers two jacks for controlling the Herbert III with Diezel's FS7 and Columbus switchers, or you can get the very most from the amp with its MIDI functionality. The Herbert III even makes your sound engineer's life easier with the inclusion of a great-sounding compensated line output.